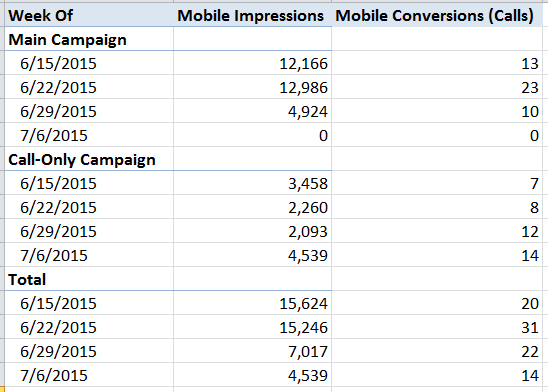 If you have a PPC account that’s doing well, chances are you’ll want to expand it at some point. One way to give yourself a better chance for more clicks is by using ad extensions. 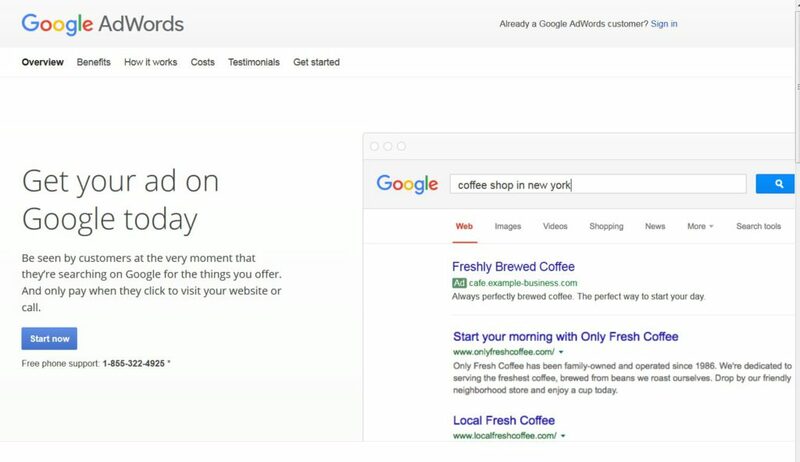 Ad extensions are a great way to help make your ad stand out on the search results page. Ad extensions usually help your ads get a better click-through rate, which can increase traffic and conversions. To have ad extensions display, ads must appear in the top 1-3 positions, above the search results. Sitelink extensions are additional links that display below your ad, leading to pages on your website other than your ad’s final URL. Sitelinks are commonly used to show complementary products, FAQ pages, reviews, and other pages that you wouldn’t want to use for your main landing page, but may provide additional information to help the searcher buy. In the image below, sitelinks are highlighted in red. Each sitelink must have a different URL from your ad’s final URL. Callout extensions are similar to sitelinks in that they offer the opportunity to display additional text. However, callout extensions aren’t links. Instead, think of callout extensions as a way to give more information about your company. Using descriptive text such as “free shipping,” “24-hour service,” and other features that you want to share with the searcher is a good way to use callout extensions. Slogans also work well in callout extensions, especially if your slogan is well known. Callout extensions are highlighted in red in the example below. If you offer a mobile app, you can drive downloads via app extensions. For e-commerce advertisers who offer a shopping app, encouraging searchers to download and use your app instead of buying on your website can help make shopping easier for the user, therefore potentially increasing your sales. All the user has to do is tap the “Call” icon, and a call is placed to your business. Advertisers pay a per-click fee for each call tap, just as you would for a click to your website. 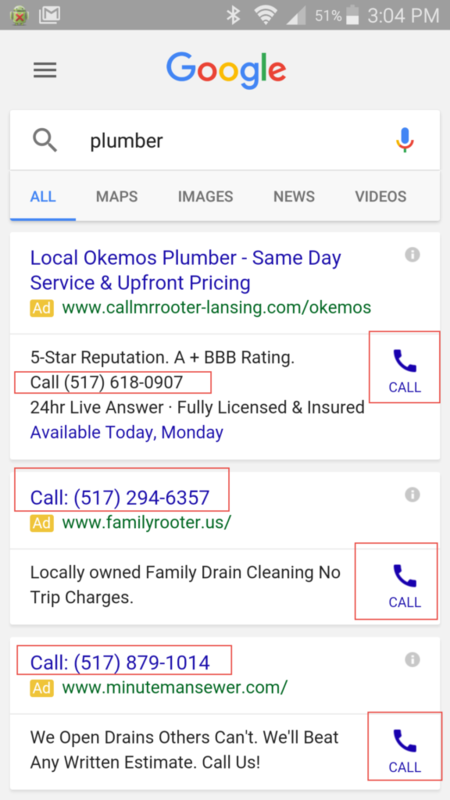 Location extensions allow advertisers to include their business address, directions to their business, a phone number, and a pin on Google Maps. The default is to add all business locations to your account. Location extensions can help drive both online and in-store traffic for your business. What’s your favorite ad extension? Do you use extensions for all your clients without fail? Share your experiences in the comments! Yesterday there was an article published on BBC entitled Boy racks up 100,000 euro bill advertising his brass band. Unbelievable – some 12 year old kid in Spain opened an Adwords account and racked up 100,000 euro (about $111,000 in US dollars) on PPC ads. First off – parents, don’t let your 12 year olds sign up for Adwords. Monitor their internet usage, for Pete’s sake. It seems clear to me that you’ll pay when someone clicks, but read that sentence carefully: “And only pay when they click to visit your website or call.” I can see how an uninitiated user, especially a child, could think it means “And Google only pays you when they click to visit your website.” It’s a stretch, but I can see it. Google, in their attempt to make the Adwords barrier to entry very low, has oversimplified things. I’ve written about this before. There’s no shortage of stories about people who have wasted thousands of dollars, or more, on ill-advised Adwords ads. There’s the small business owner who didn’t keep up with his campaigns and competitors. 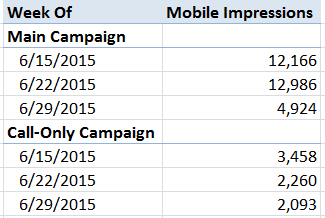 Once upon a time, 10 or more years ago, it was possible for novices to run a fairly successful Adwords campaign. Those days are long gone, just like the days of fixing your own car are long gone. Nowadays, you need a good mechanic for your car, and a PPC professional to run your Adwords campaigns. 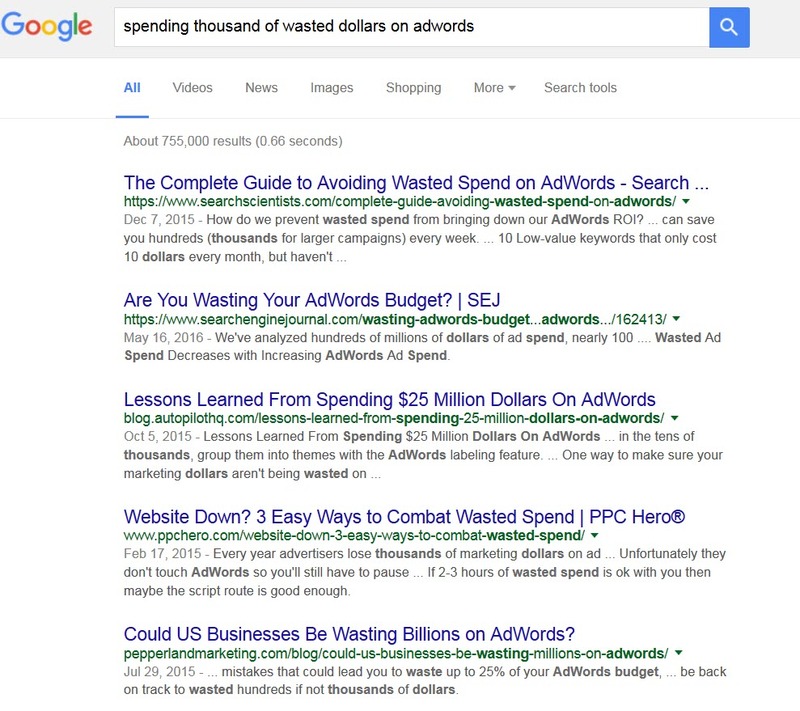 755,000 results for a long-tail search about wasting money on Adwords, and a ton of blog posts in the top 10 results. Clearly it’s not just this poor Spanish kid, who luckily got Google to credit him back (or I think his mother did – go Mom). 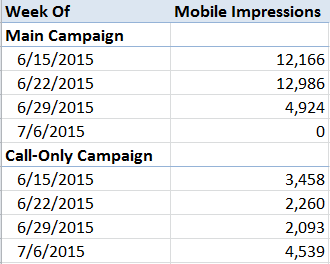 Does this mean no one should ever try to run their own PPC campaigns? I’d say no, but I hesitate in giving that answer. With all the complexities in PPC these days, it’s wise for small business owners or individuals to at least have a professional look at their account. It’s worth paying someone a couple hundred bucks to avoid losing thousands, in my opinion. Or, consider hiring a PPC professional to run your account. I know plenty of PPC pros who take small side jobs, or who will perform audits for a nominal fee. It’s worth it. What do you think? Should Google somehow “gate” Adwords to keep the kids out? Or is it ok the way it is? Share in the comments! 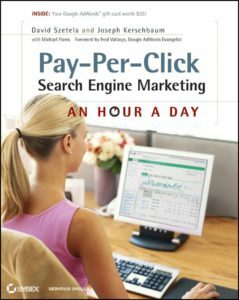 One of my favorite books for new PPC pros is Pay Per Click Search Engine Marketing An Hour a Day by two of my favorite PPC people, David Szetela and Joe Kerschbaum. The format of the book literally takes the reader on a 9-month journey to learn all the ins and outs of PPC – in just one hour per day. Published in 2010, you may think the book is totally outdated by now. And if you look at it on the surface, it is. But I still recommend PPC An Hour A Day to novice PPC’ers, because the fundamentals haven’t changed in the 14 years I’ve been doing PPC. Keyword research is still keyword research. Good ad copy is still good ad copy. Good landing pages are still good landing pages. Sure, the screen shots may not look like what you’re seeing, but if you look past that, you’ll learn how to do PPC the right way by reading this book. The first three chapters of the book cover PPC fundamentals: the art and science of PPC, how PPC works, and core PPC skills and objectives. These chapters are a sort of “required reading” prerequisite for the meat of the book, which is the “hour a day part.” Readers will need to devote the time to read about 50 pages before they jump into any real PPC work. And that’s a good thing – PPC is so complex these days that it’s risky to just start running campaigns without any background knowledge. Once you finish the first 3 chapters, then the “hour a day” work begins. I love the progression of the book: it starts with keywords, ad copy, and landing pages, which are the building blocks of a successful PPC campaign. From there, it moves into optimization, Microsoft, and Adwords Editor. The book is Adwords-first, meaning it teaches you the concepts in Adwords, and then moves to other engines. This approach makes sense, since Adwords is the standard-bearer for the PPC industry. It’s often easier to launch campaigns in Adwords, and then import them to Bing Ads. Probably the only section of the book that’s truly outdated is the chapter on Microsoft’s Bing Ads. It wasn’t even called Bing Ads when the book was written – it was still Microsoft adCenter. Most of the differences between the old adCenter and Adwords mentioned in the book have been brought to parity by the Bing Ads engineering team, so you’ll have fewer gyrations to go through when importing your campaigns. The book also covers YSM, which doesn’t exist anymore. Sure, there is Yahoo Gemini, but it’s quite different from the old YSM, and not as widely used. I still recommend reviewing these chapters, as there is a lot you can get out of the Microsoft chapter in particular. All in all, PPC SEM An Hour a Day is a book that stands up over time. The fundamentals are there, broken out into digestible chunks that anyone can master. And if you’re working through the book and have questions, remember there’s always PPCChat on Twitter. ! Come ask us about anything you read that’s confusing – we’re here to help! You can find PPC SEM An Hour a Day on Amazon. Check it out and let me know what you think! Note From Melissa: You are going to love this epic marketing guest blog by Bryant Garvin of Bryant Garvin Consulting. Let’s jump right in! Things were shaking up, and the whole entire universe – well at least the online marketing universe – was thrown into complete and utter chaos. The number of hours (and combined brain power) wasted invested in speculation, and worry about the changes coming down from The OG (Google), could have easily figured out any number of national (or international) crises. Google had done the unthinkable… they actually changed the layout of their desktop SERP and the position of ads. What the hell were they thinking? Didn’t they know this would upset the fragile balance (and sanity) of the online marketing ecosystem. What would those who focused on organic results (read SEO) have to say about their search results being pushed even further down the page? What did this mean to all of the precious bidding algorithms so many data scientists and PPC practitioners has slaved over for hours on end? Would the POTUS intervene and issue an executive order to stop the insanity? How could life go on if he didn’t? I am sure many of these thoughts ran through the OCD laden minds of many search practitioners on Friday, February 19th, 2016. OK, so I am sure most except for the last two, although a variation of the last question may have still be silently whispered by many. Why the hell am I bringing this up? Well because we need to stop the insanity. Every. Google, Bing, Facebook, Twitter, Yahoo or a host of other companies decide to make changes to day to day operations, or algorithms. The one constant in marketing, (as well as life), is change! If you don’t agree with that statement, guess what? Change doesn’t give a damn whether you agree or not, it just keeps on doing it’s thing… changing… everything! Now I will be the first to admit, I don’t always like some of the changes – or the rationale behind them (it’s for the users) – but it doesn’t change the fact that it is inevitable. Change is honestly a big part of the reason all of us ADHD ridden people are drawn to digital marketing. What was normal 2 years ago, is laughed at when suggested as a best practice today. In just the last month these are just a few of the “changes” which have happened. As the online ecosystem continues to “mature” don’t expect for changes to come less frequently. In fact if you don’t begin expecting for changes to happen, you will soon be left behind, much like the Alta Vistas of yesterday. Mobile as a percentage of all online activities is going to increase. The IoT (internet of things), is going to drastically shake up how much data is at our disposal, and how we can advertise against it in the near future. Google, Bing, Facebook and others will continue to push changes which increase their revenues. Organic traffic needs to be invested in, but with the understanding that what was “given freely”, can and will be easily taken away. Remember all of these companies – we rely on daily to inform us and connect us with family, friends, clients & more – are for profit companies whose primary marching order is to increase value for share holders. Once again, that’s OK! Again, I am not saying I love all of the changes that are happening or that will in the future occur. In all honesty some of them I absolutely hate, (I’m looking at you Google and your lack of Tablet Bid Modifiers). Do you agree with me, or should we all just keep whining and complaining about things we can’t influence or change? Bryant has nearly a decade of SEM experience under his belt, and his keen insight on harnessing the power of paid search have seen him tagged #PPCDictator amongst his peers. Bryant is Chief Consultant at Bryant Garvin Consulting – where he works with companies to improve ROI from their marketing activities. His focus on mobile user experience and conversion rate optimization makes him uniquely suited to help companies focus on the future. When he isn’t helping companies improve their bottom-line he enjoys spending time with his wife and kids, & watching awesome movies. Ah, the new year. Time for New Year’s resolutions. Yesterday, the gym was packed with people, many of whom sadly will not last past Groundhog Day. Losing weight is the #1 New Year’s resolution. But I’m not going to talk about that (although I could). I’m going to talk about the #2 resolution: getting organized. We all have that one room in our house that’s disorganized. Stuff is everywhere, with no rhyme or reason. People often joke about tax records that are thrown into a shoe box. Ever tried to do your taxes that way? Ever tried to find a file on a computer with no subfolders? It can be done, but it’s time consuming. The same thing goes for PPC accounts. Account organization is crucial for efficient PPC management, no matter the size of the account. For large accounts, it’s imperative. Enter Adwords labels. Adwords labels help you organize your PPC account and quickly filter and view information in a number of different ways. The traditional PPC account structure sometimes doesn’t go far enough to organize your account properly, especially for large accounts. You might have campaigns divided by network, country, language, product, and offer, for example. You can use campaign names for this: Search-US-English-WidgetA-FreeTrial, for instance. And this is exactly what I usually do. But what happens when you need to add even more dimensions to the mix? Super-long campaign names can get unwieldy. This is where labels come in. Add labels for the additional dimensions. Here’s another scenario. Let’s say that you’ve grouped campaigns by product line, and within each campaign you have multiple offers: purchase, trial, demo, and content download. And let’s say you want to see how each offer performs across the board. There are a number of ways to do this, of course, but one of the ways is to create a label for each offer. Then you can filter the data and view each offer’s stats individually. One of my favorite ways to use Adwords labels is for ad copy tests across ad groups. If you’re running a pricing test across multiple products with different prices for each product, it’s nearly impossible to summarize that data in an Adwords report. But if you add labels to your ads, Price Point A, Price Point B, etc., summarizing the data is a cinch, especially if you throw it into a pivot table. We all love remarketing. Large PPC accounts often have hundreds of remarketing lists. And Google doubles the number of lists by adding Similar Audiences – resulting in pages upon pages of lists to sort through. Adding labels to remarketing lists can help filter things down to a reasonable number. I label all Similar Audiences, just so I can filter them out when looking at my lists. I also create labels for lists specific to RLSA. If you use any campaign automation, such as bid rules, you might want to label ad groups using them. Many advertisers use labels for locations, campaigns with bid adjustments, dayparting notations… the list is nearly endless. Making use of Adwords labels will organize your account in a flash! Now, to get Bing to add them… How have you used Adwords labels to organize your PPC account? Share in the comments! One of the most useful Adwords features is ad extensions. Available extensions include call extensions, review extensions, location extensions, sitelink extensions, and callout extensions. This post is all about sitelinks and callout extensions. At first glance, sitelinks and callout extensions appear to be the same thing. They’re both text that might be added to your ad if you appear in one of the top spots on the page. So what’s the difference between the two and how are they used? Sitelinks contain a link; callouts are just text. Sitelinks and callouts may look the same, but the key difference is that sitelinks contain a link (hence the name), while callouts are just text. As you might expect, sitelinks appear in blue, indicating a clickable link; while callouts look like regular gray ad text. Sitelinks require a relevant destination URL that’s different from your ad’s destination URL. Here’s where things get both fun and tricky. To use sitelinks, you must use a different link from your ad’s destination URL. If you’re selling women’s dresses in your ad, you might add sitelinks for slacks, blouses, or accessories. You might use sitelinks for deals, as EAS does in the screenshot above. Just make sure that the links make sense and that they add to, rather than take away from, your ad copy. For B2B advertisers, sitelinks can be challenging. It’s common for B2B advertisers to only have one relevant landing page, so sometimes sitelinks are a worst practice for B2B. Callouts, on the other hand, are just text. You can say pretty much whatever you want, although you should consider the callouts part of your ad copy. Make sure they’re relevant. Think carefully about the sitelinks you use. While it may be interesting to send people to your “Careers” or “About Us” page, these pages are unlikely to generate conversions. Remember, you pay for every click, whether it’s on a sitelink or the ad itself. Don’t send traffic to pages that can’t convert for you. The sitelinks in the screen shot above are all good – they’re sales-focused pages that should contribute to conversions for the advertisers. • Additional info about your product/service: what it does, who it’s best for, etc. • Info about the company: years in business, etc. I like to put slogans in callouts. Clients get very attached to slogans and taglines, but slogans usually take valuable characters away from benefits and calls to action in ad copy. Putting slogans in callouts is a great way to please the client without taking up real estate. Use sitelinks and callouts correctly. As I mentioned before, the sitelinks are all great. But the callouts in the EAS ad don’t make sense. “Join Team EAS”? How do I join? There’s no link to the page. Nor is there a link to the custom workout plans or coupons mentioned in the callouts. This is basically copy that makes a promise that can’t be delivered, and is a poor user experience. GNC, on the other hand, is using callouts correctly and even creatively. Callouts are limited to 25 characters, so GNC split their “Quality Life-Quality Products” slogan into 2 callouts. This tactic may not work every time, but it’s clever and smart. What are your favorite ways to use sitelinks and callouts? Share in the comments!